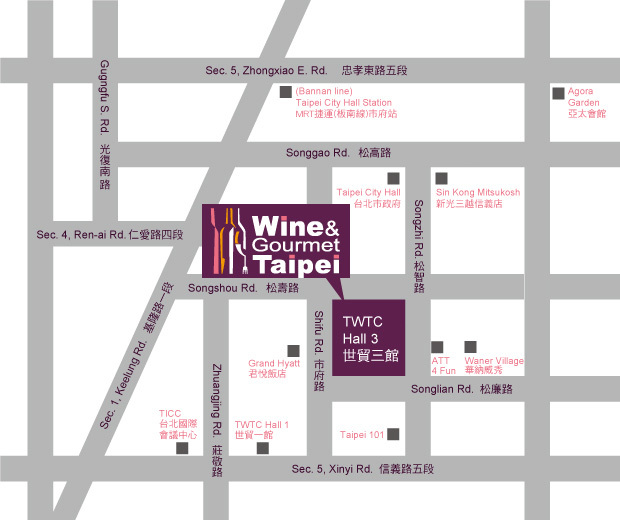 How do you want to get to the exhibition ground in Taipei? CKS Airport offers you various direct connections to downtown Taipei. You may select one of the following ways of to arrive at THS. Buses leave every 10 to 30 minutes from Terminal One. Those entering the Arrival Area after leaving Customs, can proceed to the left side of the Hall to purchase bus tickets and board buses. A one-way ticket costs NT$120. The trip usually takes about an hour. The average fare (plus surcharge) to Taipei is about NT$1,200. Taipei has the highest concentration of taxis anywhere in Taiwan. So you'll have no trouble hailing a cab any time, day or night, to get you safely to your destination.Taxi Receipts are available upon request and tipping is not necessary. Air-conditioned city buses are frequent and plentiful, and fares differ according to the distance traveled. Bus over (to the TWTC stop) on bus routes 1,20,22,33,38,226,288,292,612 and the Hsin-Yi Line. Just hop on the Blue Line and get off at and a 10 minutes walk to the TWTC.